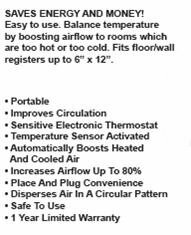 Suncourt's Equalizer® EQ2 boosts airflow to problem areas, giving you the comfort your family deserves. The Equalizer's powerful, quiet fan works to pull extra air out of weak registers, increasing airflow by up to 80%. • Fits over floor or wall registers up to 6" x 12"
What will the Equalizer EQ2 do for me? The Equalizer EQ2 is designed to be placed over a floor or wall register (6" x 12" maximum size) to boost the airflow from that register. By boosting airflow, it will warm up rooms that are chronically cold in the winter and cool down rooms that are chronically too hot in the summer. Does the Equalizer EQ2 heat or cool the air? No. The Equalizer EQ2 does neither heat nor cool the air. It boosts airflow from a register, thus bringing more heated air from your furnace or cooled air from your air conditioner into a problem room. When I hold my hand above the Equalizer EQ2, I do not feel much air. The Equalizer EQ2 has a patented fan system that disperses the air in a more or less horizontal circular pattern. To blow air from the unit straight up to the ceiling is not desirable. Hold your hands to the sides of the air exhaust grille of the Equalizer EQ2 and you will feel the airflow. This way, the air stays at the lower room level; not the ceiling. The air coming from the Equalizer EQ2 feels cold during the winter heating season. Moving air flowing over your skin feels colder than still air. The temperature of the air is in fact the same. That "cold" sensation on your skin comes from the evaporation of the moisture on your skin caused by moving air. That is why sitting in the airflow of a fan feels good on a hot summer day. The air from that fan has the same temperature as the other surrounding air. Again, the air movement over your skin causes the chilly sensation. That is why drafts are so uncomfortable. How do I connect the Equalizer EQ2 to the power? No installation is required for the Equalizer EQ2. You simply place it over a floor register (6" x 12" maximum size) and plug it into the nearest 110 Volt wall outlet. How much electricity does an Equalizer EQ2 use? The Equalizer EQ2 uses 27 Watts when running. Like a small light bulb. Can I mount the Equalizer EQ2 on a wall register? Yes, small keyhole slots are provided in the bottom grille of the Equalizer EQ2. Depending on the size and type of wall register, you may install screws in the register or surrounding wall and simply hang the Equalizer EQ2 on those screws. In some instances, it is not possible to install screws for hanging the Equalizer EQ2 with the function panel label on the top. In this case you will need to hang it upside down. Note that the lettering on the function label will be upside down also. Does the Equalizer EQ2 have to cover a register entirely? Yes. The Equalizer EQ2 must cover a register grille opening entirely. The Equalizer EQ2 is designed to create a slight vacuum at the register, thus pull air from the duct. You do not want to pull in room air. How do I turn the Equalizer OFF and ON? Your Equalizer EQ2 is equipped with a highly sensitive electronic thermostat. This thermostat will automatically turn the fan ON when it senses heated air after the furnace starts. Similarly, it will turn the fan ON when your air conditioner starts. This operation is fully automatic and you have a control on the function panel to fine tune when you wish the Equalizer EQ2 to start and stop. Can I run my Equalizer EQ2 continuously? Yes. On the function control panel you will find a switch setting "HEAT" for automatic operation with your furnace in the winter and "COOL" for automatic operation in the summertime with your air conditioner. The "ON" setting provides continuous operation. Why do the instructions say, "unplug when not in use?" We recommend that you unplug the Equalizer EQ2 between seasons when neither the furnace nor air conditioner is operating, during vacations when you are away from home, etc. This will save wear and tear and unnecessary energy use. Can I mount the Equalizer EQ2 over a ceiling register? Suncourt recommends against mounting an Equalizer EQ2 over a ceiling register for safety concerns in the event the unit would fall down if not properly attached. Also, since the airflow is exhausted in a circular pattern, the boosted warm air will remain at the ceiling. Can I use the Equalizer EQ2 upside down? The Equalizer EQ2 will operate in any position. Can I use the Equalizer EQ2 to vent outside air? No. The Equalizer EQ2 is not approved to vent outside air (such as in a window) where the unit may become wet from rain or excessive moisture. Is the Equalizer EQ2 safe? The Equalizer EQ2 has been rigorously tested to the Standards of Underwriters Laboratories Inc. (UL®) for your safety. The housing is made of a high impact flame retardant ABS material and the electric motor is Thermally Protected. The fan impeller is made out of Polycarbonate material, the material used for jet fighter canopies. How do I clean my Equalizer EQ2? Generally, maintaining a clean household and regularly replacing the central air system filter will avoid build-up of dirt and dust in the Equalizer EQ2. The Equalizer EQ2 cannot be opened for cleaning. Doing so would void the warranty and poses a risk of injury. Normally, accumulated dust can be blown out of the unit and dirt can be removed using a small brush or cotton swabs.